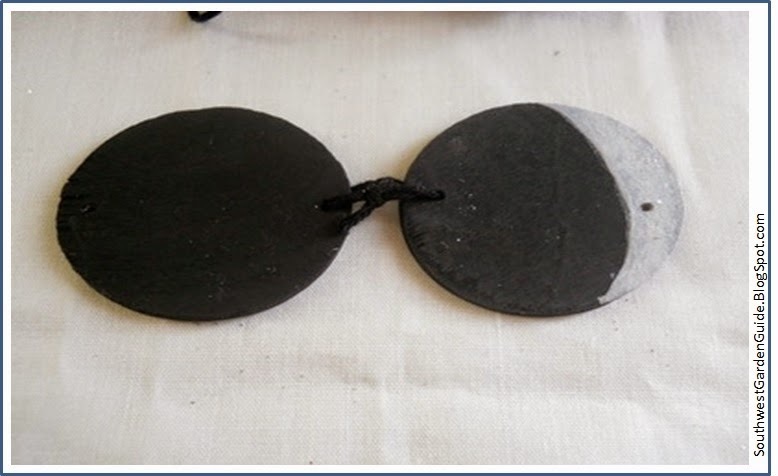 Gardening by the moon phases has been in practice since the early days of domestic gardening. Even our forefathers like George Washington, William Penn and Ben Franklin gardened by moon phases. It's a technique that has been known to speed the germination of your seeds by working with the forces of nature. Just like people and animals are affected by moon phases, so are plants. Plants, people and animals respond to the same gravitational pull of tides that affect the oceans. The gravitational pulls actually stimulates root and leaf growth. Seeds will sprout more quickly and plants grow faster at an optimum rate. Your harvests will be larger and the plants won't bolt or go to seed as fast when you follow a garden moon phase. This method has been practiced by many for hundreds of years. It's most effective if you have the time to study a moon phase chart. All living organisms for some reason have a bio-rhythm to the moon and it's phases all year long. Another aspect to gardening by moon phases is that the lunar phase actually controls how much moisture is in the soil. Just like the sun, the moon can also evaporate moisture. Scientists have a way of predicting this. The moisture is at it's acme or peak during a new or full moon. When the sun and moon are lined up, there is a gravitational pull that effects oceans, lakes and other bodies of water. Moon phaes really do encourage or discourage germination and growth of plants. Nomads to modern day farmers have planted crops according to moon phases. Besides planting crops in sequence to moon phases, there's also pruning, harvesting, cultivating to be done. A waxing or waning moon can really make a difference in your bountiful harvest. Purchase a Farmers Almanac and you'll see a wonderful easy to read guide that will illustrate each phase of the moon. Farmers Almanac also have a wall calander available that can be hung in your garden shed. You can find them at Amazon or Walmart for about $5 - $6. That way you’ll know when the moon is either new or full or waxing or waning while you're preparing your planting. 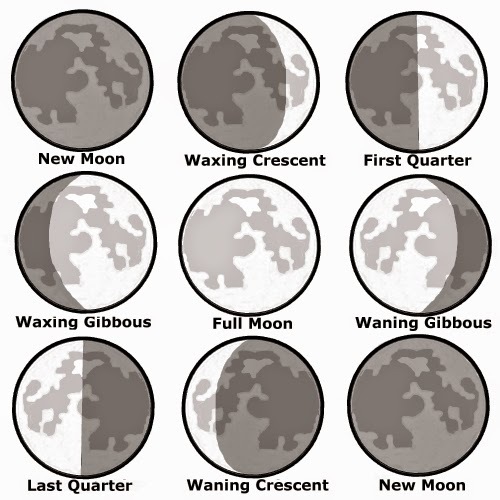 - When the moon is changing from a new moon into a full moon, it's called "waxing". For a really great instructional site to easily learn more about our moon and its phases one of NASA's kid pages, apps, instructionals, etc. There's a few good recipes as well. 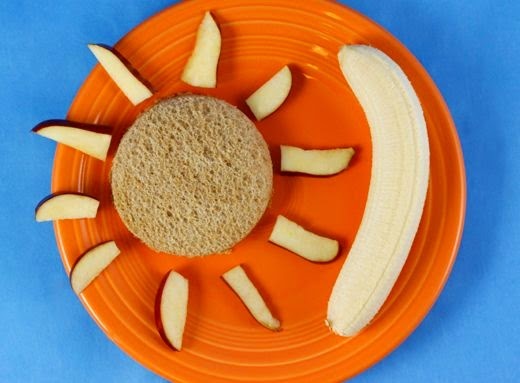 Create a healthy snack that looks just like the sun and moon! Make a peanut butter sandwich. Use round cookie cutter and press down on bread to cut out what will look like a round sun. Slice apple in wedge like pieces that look like sun rays. Place around the sun. Peel banana. This will be the moon. *It's also fun to place a photo of the sun and moon in your child's lunchbox to they can simulate it themselves. Crafting the Moon - Sensational Moon Phase Banner! 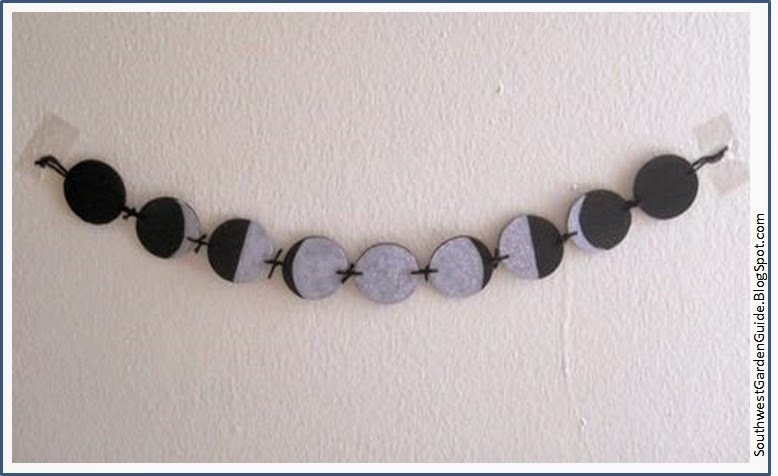 In primary school we made moon phase banners from black and gray felt but, I think making the moon phase from round balsa wood is much better and more durable. It's just as easy to paint the scroll saw cut outs as cutting felt. 9 - 3" dia. 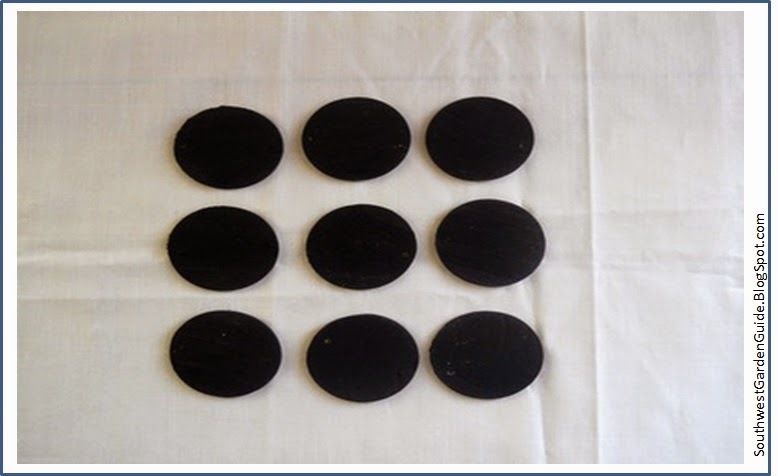 Wood round cutouts (larger size can be used). Needle or toothpick to help push string through holes. *Optional - clear glow in the dark paint. *Your choice to drill hole before or after painting. If your craft paint is thick acrylic, you may want to drill holes after painting wood cutouts; otherwise, holes may get clogged with paint. 1. Paint all wood circles black. 2. 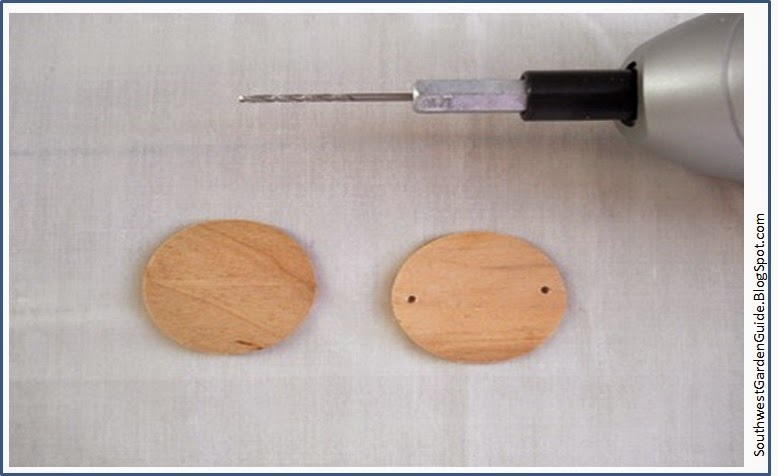 Drill holes in circles using 1/16" drill bit or use small nail and hammer. 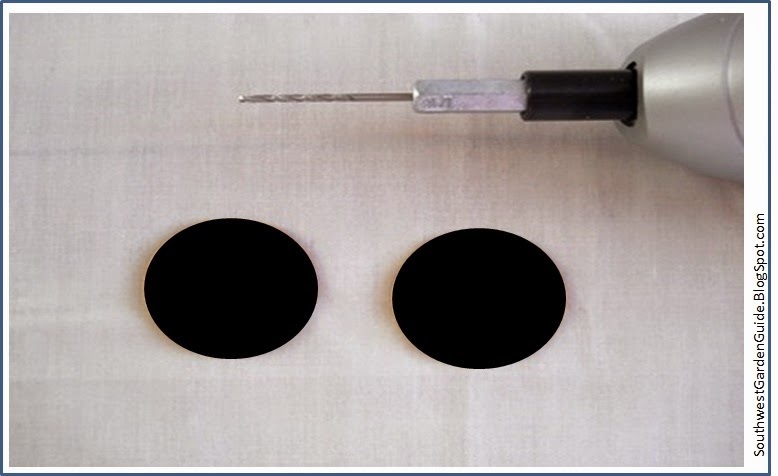 *Depending on thickness of paint, holes can be drilled either before or after painting. 3. 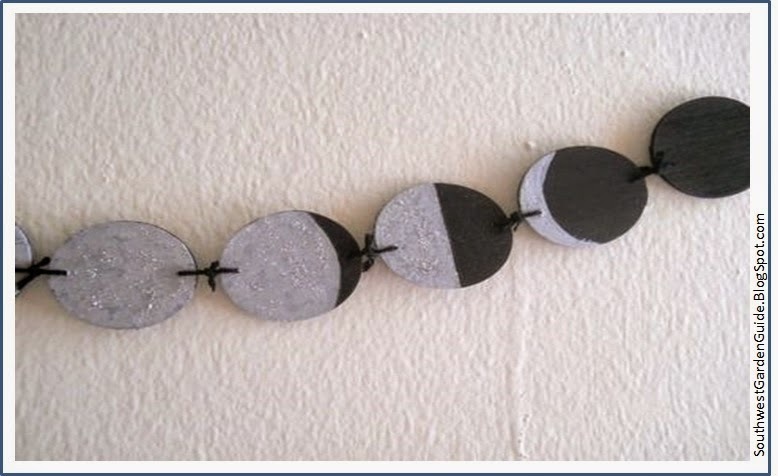 Paint moon phases in gray using photo below. 4. Once dry, use 2" embroidery thread to tie each round cutouts together. You can either thread string through thin needle and push through hole, then cut string to size or you can pre-cut string and use toothpick to push thread through hole. 5. 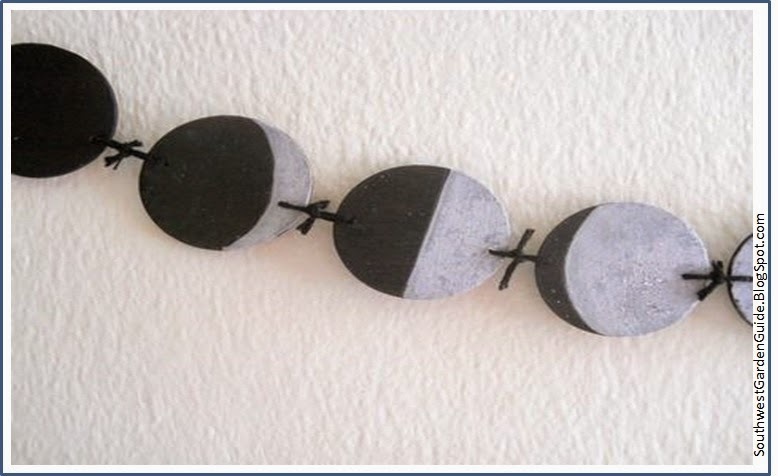 Attach circles according to moon phase sequence. 6. Attach end strings to the desired length for hanging. 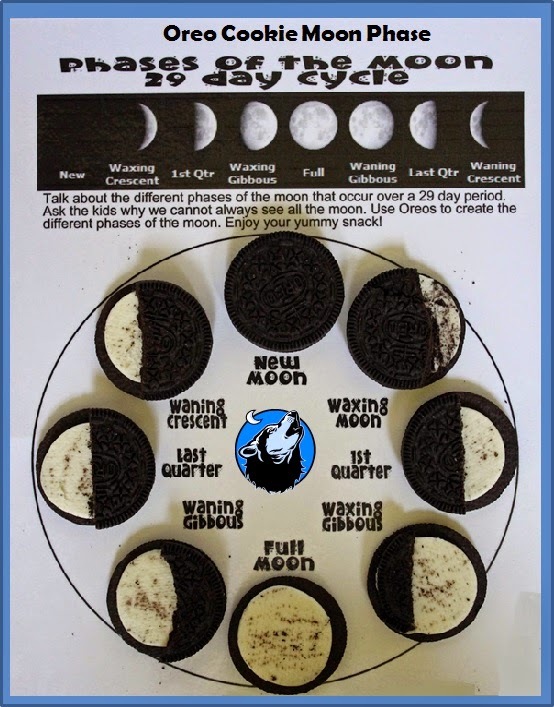 This is a great instructional item to help you or your child learn moon phases. It's also a wonderful item to celebrate the cycles of the moon. It's also wonderful to cover the gray paint with a clear glow in the dark paint to make the banner visible in the dark.